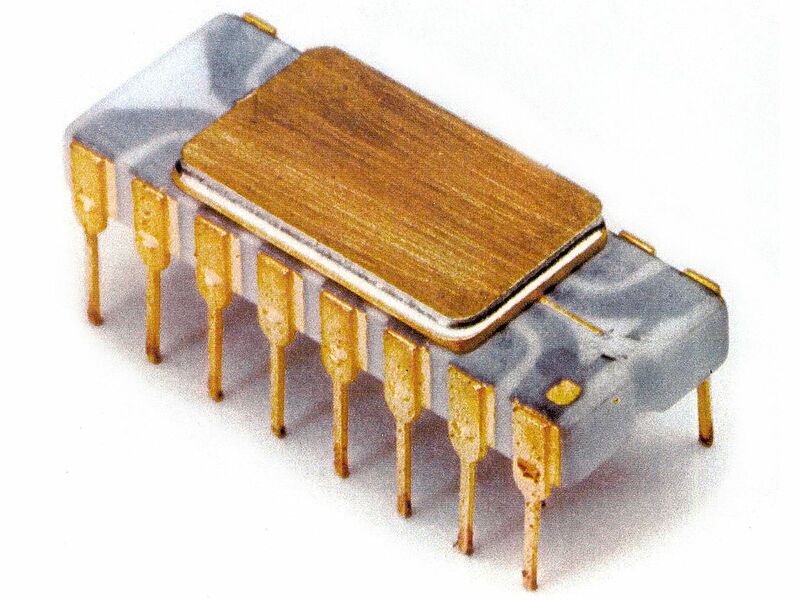 The Intel 4004 was the world’s first microprocessor—a complete general-purpose CPU on a single chip. Released in March 1971, and using cutting-edge silicon-gate technology, the 4004 marked the beginning of Intel’s rise to global dominance in the processor industry. So you might imagine that the full resources of Intel—still a fledgling company at the time—were devoted to this groundbreaking project. But in fact, the 4004 was an understaffed side project, a crash job that nearly crashed, one simply intended to drum up some cash while Intel developed its real product line, memory chips. As described by Ken Shirrif in a July 2016 feature for IEEE Spectrum, the increasing transistor count and complexity of integrated circuits in the 1960s meant that by 1970, multiple organizations were hot on the path to the microprocessor. Some of these, like Texas Instruments, had a lot more resources than Intel. So why did Intel, founded just a few years earlier, in 1968, cross the finish line first? It was largely thanks to four engineers, one of whom didn’t even work for the company. (For a lengthy version of this story from the engineers themselves, you can read their oral history panel, as captured by the Computer History Museum). 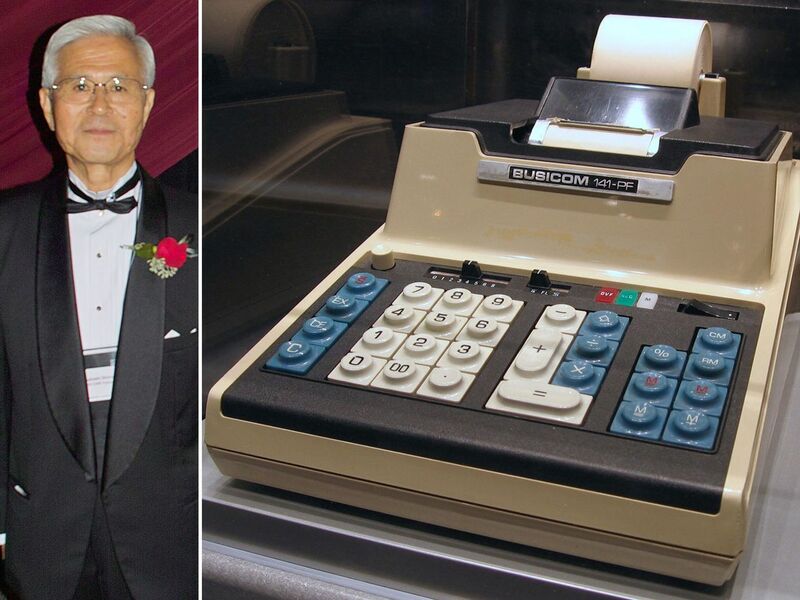 The first of the four engineers is Masatoshi Shima, who worked for Japanese office calculator company Busicom, which wanted to create a new computerized calculator. In April 1969, Busicom and Intel signed a provisional agreement for Intel to develop a custom set of chips for the calculator. Consequently, in June 1969 Shima and others traveled to Intel to discuss the plans in more detail. Shima proposed an eight-chip system: three chips to interface with peripherals such as the keyboard and printer, one chip to store data, one chip to store program code, and two chips that together would make up the CPU. Masatoshi Shima at the Computer History Museum’s 2009 Fellows Award event, and the Busicom calculator that was the target application for the world’s first microprocessor. Ted Hoff is the second engineer in our tale and was the head of the Intel applications department that was negotiating with Busicom. Hoff was worried that Intel would struggle to produce so many chips, especially because the system would require many pins per chip to interconnect, which would push the limits of the ceramic packing technology Intel was using. He proposed halving the chip count: one 256-byte program memory chip, dubbed the 4001, one 40-byte data memory chip, the 4002, a peripheral interface chip, the 4003, and one CPU chip, the 4004. The whole system—called the MCS-4—would be 4-bit, significantly reducing the number of pins needed to interconnect the chips. Hoff brought in engineer No. 3, Intel’s Stanley Mazor. Together Hoff and Mazor put together a set of specs for each chip and a proposed production schedule. At a follow-up meeting in October of 1969, Intel made its counterproposal. Busicom was interested and Shima returned to Japan to prototype software for the new calculator to make sure the MCS-4 architecture would support Busicom’s needs. An agreement was made in February 1970, with Busicom planning its calculator rollout on the basis of Hoff’s and Mazor’s schedule. It was decided that Shima would come back to California to check on progress in April 1970. The chips were to be put into production on a staggered schedule from July to October 1970, starting with the 4001 and ending with the 4004. However, unbeknownst to Shima and Busicom, the 4004 project had ground to a halt inside Intel in early 1970. The problem was that Hoff and Mazor were not chip designers—those people who can take specifications and create detailed logic-gate diagrams. Those diagrams, in turn, are used to work out exactly how and where transistors and other components are to be patterned on the physical chip. In fact, there was no one at Intel who could take on the job, as the company was then focused on developing memory chips. Finally, Intel made one of the great hires of all time and introduced the fourth critical person in this story: Frederico Faggin, a young engineer uniquely suited to the job. At the start of his career, Faggin had designed and built a computer from scratch for Olivetti, in Italy. Then in the late 1960s, he had joined Fairchild Semiconductor, in Silicon Valley, where he made key contributions to the advanced metal oxide semiconductor (MOS) technology that Intel’s chips relied on. Faggin wanted to work in a more entrepreneurial environment than Fairchild, and so accepted an offer from Intel in April 1970. 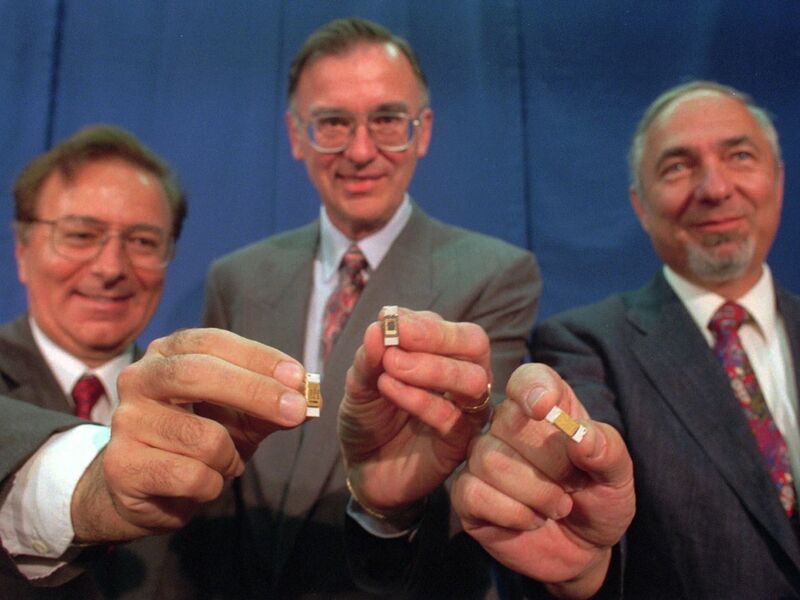 From left, Federico Faggin, Ted Hoff, and Stanley Mazor holding Intel 4004 processors at the National Inventors Hall of Fame in 1996. The original schedules were based on estimates suitable for designing memory chips—which use many repeating elements—rather than processor chips, which use complex and varied logic circuits. In addition, Faggin had no support staff and none of the tools and infrastructure that other companies had to help create and test digital logic designs. A few days after Faggin’s start, Shima landed in the States for his progress check. Mazor and Faggin went to pick him up from the airport and bring him back to Intel. Shima was expecting to see a logic-level plan for the chips that he could check against the agreed-upon specifications. “Shima was furious when he found out that no work had been done in the five months and he became very angry at me…. It took almost one week for Shima to calm down,” wrote Faggin. Faggin worked out a new schedule, and it was agreed that while Intel set about hiring more people for the project, Shima would stay for six months to help with the design. Faggin himself dived into 70- to 80-hour workweeks. 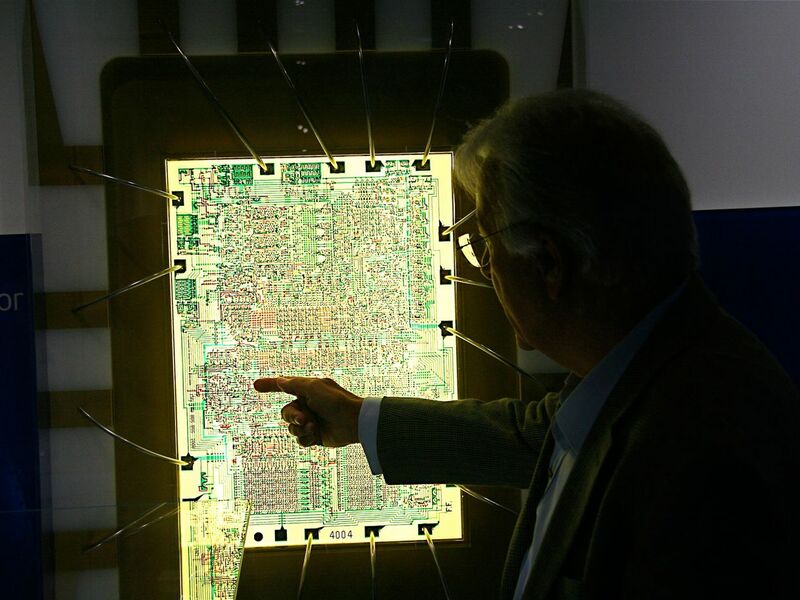 Faggin worked through the chips in order of complexity: the 4001 ROM, followed by the 4003 interface chip, then the 4002 RAM, followed finally by the 4004 CPU. Shima checked the logic of the chips and provided feedback on how they would fit into Busicom’s larger calculator design. At the end of 1970, the chip design was complete. Faggin added a personal flourish to the CPU’s layout: He placed his initials along the edge of the processor, a microscopic “F.F.” etched into every 4004 made. Busicom finally had a complete working set of MCS-4 chips in March 1971. Frederico Faggin and an enlarged picture of the Intel 4004 die. The 4004 had 2,300 transistors. As Busicom had commissioned the chipset, it had exclusive rights to the design, preventing Intel from selling the 4004 to anyone else. But after some prompting from Hoff and others about the processor’s potential, Intel offered to give Busicom a break on the cost of the chips if Intel could sell the 4000 family for noncalculator applications. Busicom agreed, and Intel began advertising the 4004 in November 1971: “Announcing a new era of integrated electronics,” blared the ad copy—a rare case of absolute truth in advertising.